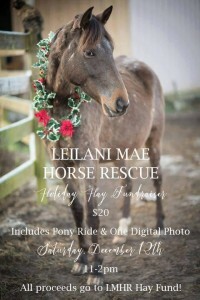 We are holding another Holiday Hay Fundraiser Saturday, Dec. 19, from 11 a.m. until 3 p.m.! For $10 Abigale and Big Red will be giving Christmas Pony rides. Sadly our photographer will not be available. All proceeds will go to the hay fund. Each horse goes through about a round bale a month. Presently we have 22 rescue horses I our care.